I’ve been making a couch slipcover in a series of posts. Today’s is How to Make a Cushion Cover! To see Couch Slipcover Part 1, click here! To see Couch Slipcover Part 2, click here! Start with these four pieces: 1 & 2) the two main pieces-top and bottom of cushion 3) the middle band and 4) the zipper piece you created from this zipper tutorial To get your top and bottom of your cushion, set your actual couch cushion on top of the fabric you want to use and trace around it with a fabric pen. Then cut it out, about a 1/2-1″ out from the line you drew (for your seam allowance and piping.) Cut two. ***If you are tracing an asymmetrical piece (like the top left or right back couch cushion on my couch) you will need to make sure that you keep the RIGHT sides opposite (in other words don’t sew the piping on exactly as you did one side because it just won’t work, trust me.) 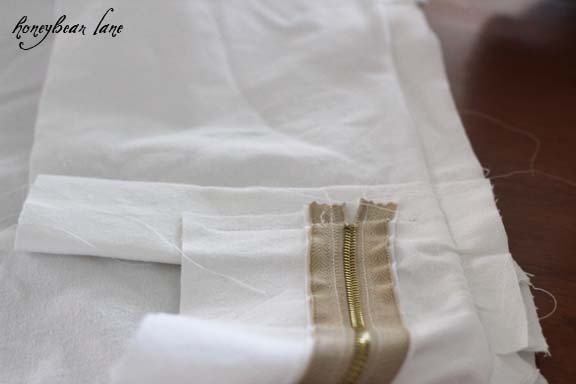 To sew piping onto your fabric, follow this piping tutorial. 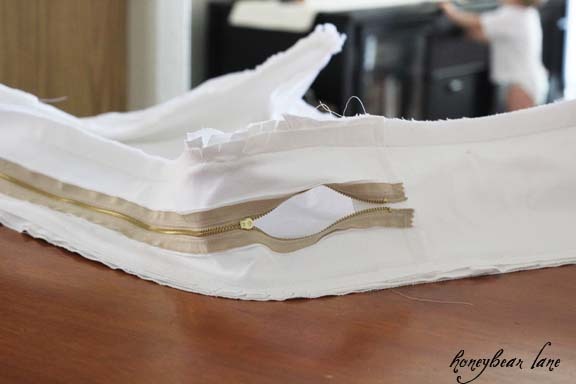 The middle band you create by measuring the height of the cushion (for the width) and the perimeter around, minus the zipper length. Give yourself several (like 5-6) extra inches tacked onto the perimeter. Take the end of the middle band and fold it over twice, about an inch each fold. Place the zipper end of the zipper piece against your folded piece like this, so the zipper right side faces the fold and the fold faces the zipper. Put a pin. PS…normally your zipper piece and the middle band should be the same width but this particular cushion was much wider at the top than at the bottom so don’t worry, I’m doing something special. Sew the two pieces together in the area above where the zipper lies. Here’s what it looks like from the front. Now your zipper has a little pocket to hide in. 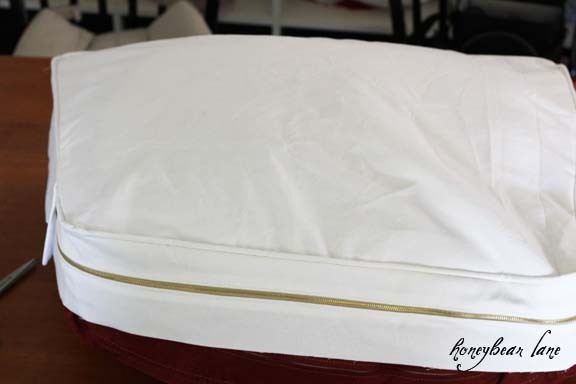 Take the bottom piece of the main cushion and lie it right side up (piping side up.) 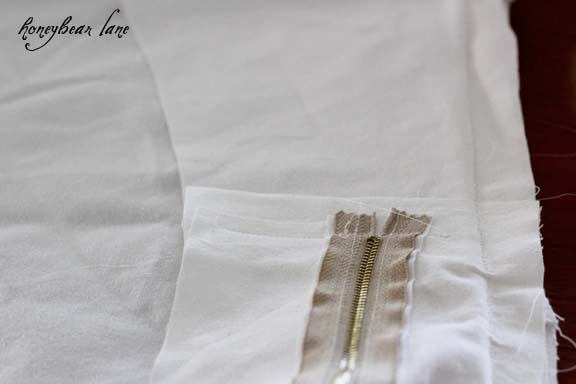 Starting with the other end of the zipper piece (the side without the zipper) facing it inward (so the right side faces the right side of the main piece) and place a few pins as you align the zipper on the bottom/back of your cushion. To round the corner, clip little notches to help. 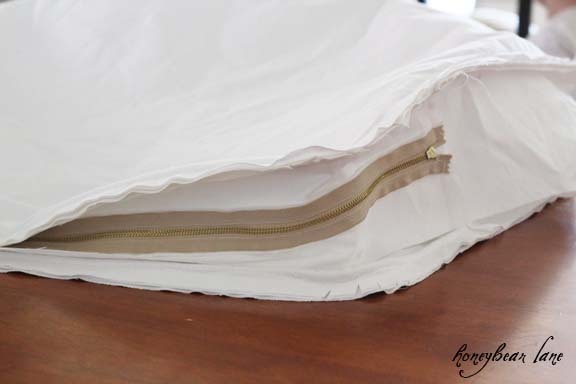 Don’t pin too many though because the fabric will need to be smoothed and stretched and you will find that pinning was a waste of time. Just line it up and sew as you go around. 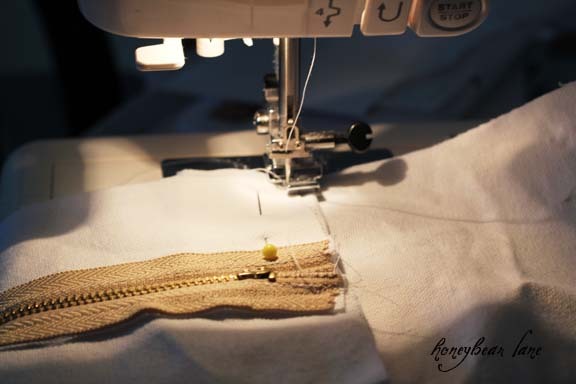 To start sewing, start a couple of inches away from the end so as to be able to join the ends together. Here I’ve sewn around the entire cushion except for a few inches on either side of the ends. 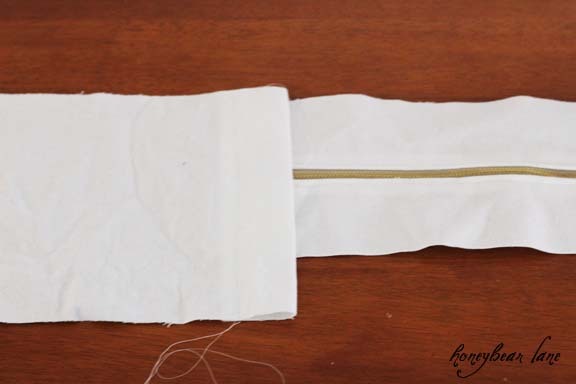 To join the ends, cut off the long excess, save a few inches so you can fold over for another small pocket. Do the same thing as you did before, folding over twice. Tuck the folded ends UNDER the zipper end and fingerpress flat, then sew it all down. To sew the actual ends together, I pin them together first then manipulate it so I can slide it into the machine and just sew it down. It’s not completely essential to sew this, but it’s nice to. Just sew the stitch until you reach the piping. This is totally the unofficial way to do this–not saying it’s the right way, it’s just what worked for me. I always flip it right side out and then slip it over the cushion to make sure it’s fitting right. If it’s not, it’s best to fix it now! Okay this is where it gets tricky. Let’s pray that your top and bottom main pieces were the same size to begin with, but it’s good to double check now. 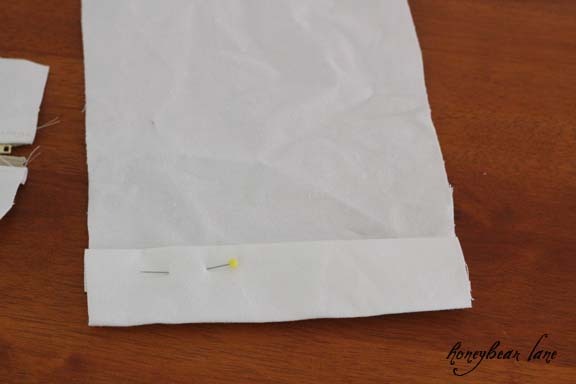 Turn your sewn part wrong-side out again and put it on top of the other piece, right side up. Match up the corners and put a pin in them. Don’t pin the whole thing together because it won’t fit. You will see that one side seems bigger than the other and you’ll want to freak out and start ripping it apart. See? Look how much larger the bottom looks than the top…plenty of reason to freak out, but don’t yet. 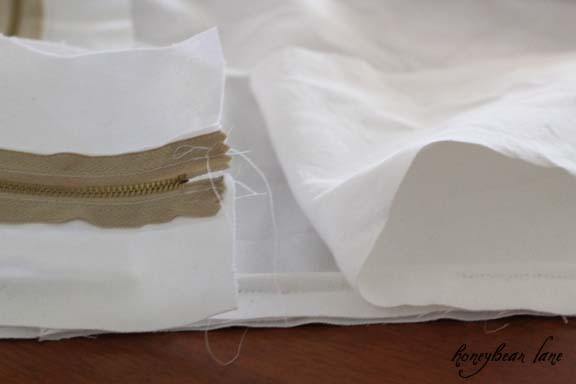 Remember that as you sew, the fabric will stretch and smooth and give you enough fabric to make it all fit. You will have to get a little crafty but you can make it work…usually. Out of the six cushions I sewed I only had one that I had to rip apart and cut a tiny bit off to make it fit. So what I do to sew it is this: I make all four corners fit with pins, even if some of the fabric is puckering. I sew the sides that fit just fine, smoothing and pulling taught as I go. 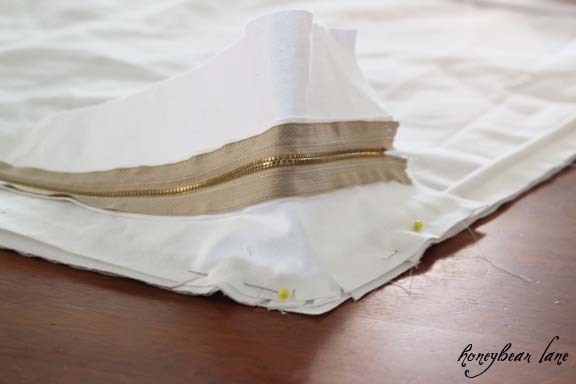 Your fabric will gather up and give you enough to sew the rest of the corners. Sorry if this doesn’t make very much sense, but to get a tight fitting cushion cover, I think it’s a pretty standard thing to expect. 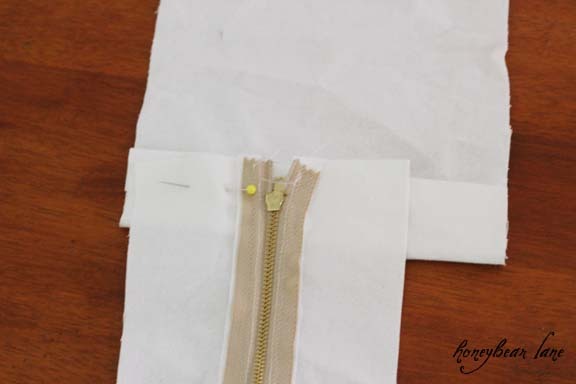 Make sure that before you sew the entire thing closed you unzip a bit of the zipper so you can finish sewing it up easily, then unzip it by reaching your hand inside. That way you can flip the whole thing right side out. And voila! Here is the completed cushion cover. I didn’t trim a thing, which I may or may not do (leaning towards not.) And yes that is my adorable baby in the background. Slide your cushion into your new cushion cover! This tutorial was done from one of my side back cushions, so you can see why it was asymmetrical and fatter on top than on bottom. The back cushions of the original couch were sewn on (I’ll show you that later) so I was planning on putting thick velcro on the back of these cushions. But they are actually staying put very well as they are AND the ability to take them off and fling them on the floor makes my couch MUCH wider when I want (which allows for much easier cuddling!) I’ve had these slipcovers on for about four or five days now and they are still looking great, despite my kids dirty summer feet. (My potty training son even had a tiny little accident on one and it was super nice to just put it in the wash, dry, and bam an hour later all was better than new.) I don’t think it will take long to do the rest and I am determined to finish this week! Don’t forget to check out the rest of the slipcover progress! And I also made a Wing Chair Slipcover! If you are new to Honeybear Lane, Please sign up to get posts through the RSS feed and sign up for our Weekly Newsletter below! It looks great! You are motivating me to work harder on my slipcover, 4 out of 6 cushin cases done… Looking forward to see how you do the main part (the cushions I figured out myselfe, but I haven’t begun thinking about that part…). Of course I am also looking forward to your great reveal! Jenn-I want to see a picture of your finished slipcover! Good luck! On your “pregnant hulk” post: I am sure that is how you see it, but I just admire all you do get done – slipcovers, sidetables, distressed wood shutters and taking care of 2 kids, wow! This tutorial was fantastic. You explained things in ordinary people terms. This makes me feel as if I can actually do this. That is so cool! Great job!! Looks great! And white – you’re so brave! It looks really great, Heidi! You are going to be so happy when it’s all done! thanks for this tutorial. it looks great. I also keep my computer under the couch. haha. It’s totally safe. Phew! That is amazing! And white! I’m coming over to see it in person. Sometime when my hubby is here and can be with the munchkins. Soon. Thank you, thank you, thank you! I’ve had a hard time finding tutorials on recovering furniture and my couch is in desperate need of some love. Any recommendations for buying the right amount of fabric? So glad I could help! I ordered 22 yards of fabric and it was too much! I wanted to make sure I had enough since I was making cushion covers for all 6 couch cushions. But the extra will come in handy. You can find upholstery and slipcover fabric guides on Fabric.com. Good luck! I want you to know that you have inspired me. I have a sewing machine that I snatched up at the goodwill. I have never sewed anything. I hope that I can do this. I am going to start with the seat cushions first. Wish me luck! Wow that is an ambitious first project! Good luck! Hi, sewing virgin here. 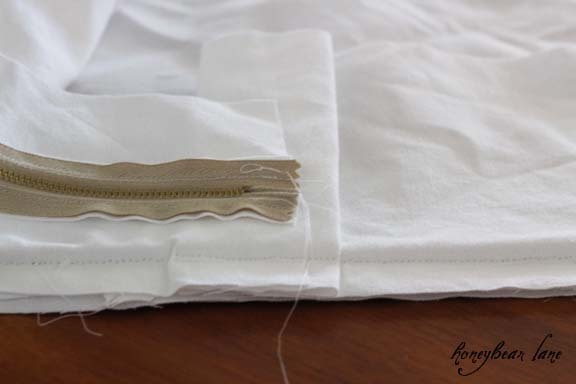 For someone that has never sewn before and would like to start, is there a sewing machine that you’d recommend? Any suggestions appreciated. Hi Kay! I have a Janome and it has never let me down. I recommend them wholeheartedly and my machine was not too expensive (like $350.) I don’t recommend Kenmores. As for the others, no idea. Good luck! I’m not sure why you don’t recommend Kenmores; maybe they’re not making them as well as they used to–which I’m sure is quite possible! I have a fairly basic Kenmore that I bought when I got married which was 40 years ago! I chose it because my sister had the same one and I liked hers, as did she. In four decades, I’ve had it in for service just once for a very minor repair. I had it cleaned and oiled at the same time; I thought maybe it was time since, at that point, it was 35 years old. It’s seen heavy use on a multitude of home decorating projects and making assorted items for three daughters. (After living in 7 different apartments and houses, I’ve never bought a ready-made curtain or drape!) It’s still going strong, making things for my daughters’ homes now as well as mine. I think I could say without hesitation that my particular Kenmore, at least, has “never let me down”! All the best with your great projects–I’m getting ready to slipcover my sofa using bleached dropcloths and appreciated all your tips. You’re obviously very talented! I don’t recommend them because I didn’t have a good experience with mine, but I know many people have had good success with Kenmore. I LOVE Janome and I think Janome owns Kenmore and they are like the less expensive versions of Janomes maybe? Hi there. What great details you give on how to do this! This is something I have wanted to take on for quite a while, and my couch cushions are sewn on like yours. Thanks for showing how you “fixed” the back! Did you leave the old covers on your couch? My cushions have a removable cover and I was wondering if I should keep that on, and just cover them up? Yes, keep the covers on! 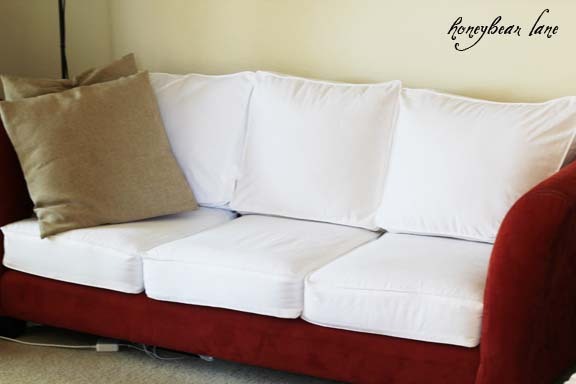 They hold the cushion together better and when it’s time to wash the slipcover you still have a protective cover over it rather than just some foam. Good luck! You make this seem sooo simple! I’ve just recently started sewing and have only done a few “refashioning” items for my kids. But, you make this appear easy enough for me to do. I love the idea of not taking off my old covers. The other tutorial I was looking at you tore the old cushion covers apart to use as a guide for your new covers. That freaked me out because what if I totally screw it up???!!!! AND, then we had to look at the ugly foam cushion mess until I finished it, plus my whole reason for recovering them to begin with is because we have a new puppy who has picked it to death. Can you imagine what she would do to the raw cushion??? Oh my!! So, all that rambling to say, thank you for your easy to follow directions! I hope to do mine soon! Yours looks great, btw! So glad it helped you! Thanks! I love your site! 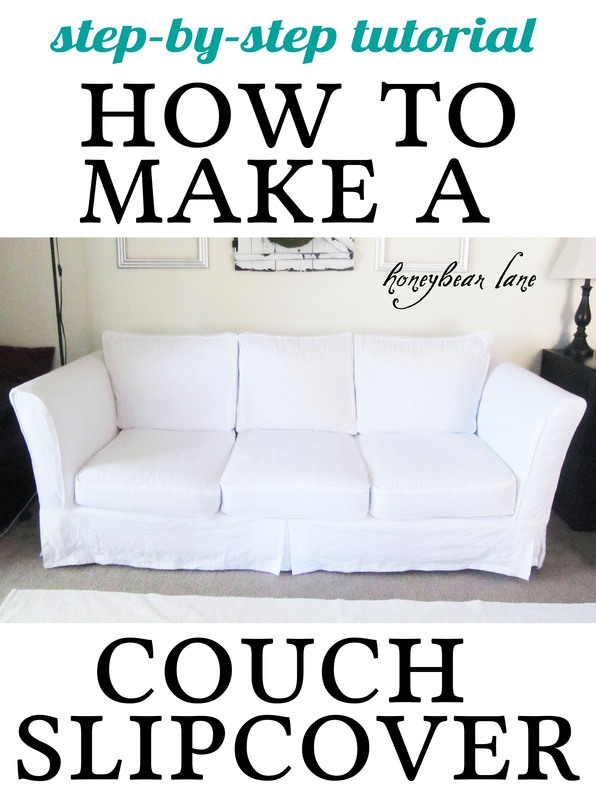 I came upon it searching around for instructions on how to make a slipcover. I’d like to change the couches in my living room, but that would expensive. Im on a mission to update/decorate the room. So I do need to buy a few things/accent pieces, and would rather spend my money on these than new couches. I just changed the foam in them and we can actually sit in them now without sinking…. So I thought first I would see if I could re-cover them myself (which is a “no”…), then started looking at making my own slipcovers. Your site is the first one which actually gives good step by step information to do this. I do some basic sewing and have made my own curtains/drapes and altered some clothing, etc. Your site has given me the courage to try my own slipcovers. Im just as excited as you are, thank you. Great tutorial! Quick question: Is it necessary to use home decor fabric? If not, what kind of fabric do you recommend? It’s not! I actually made a great slipcover from an old white sheet. In some ways I almost prefer the fabric because it’s always so cozy and cool, just like getting in bed into your sheets. 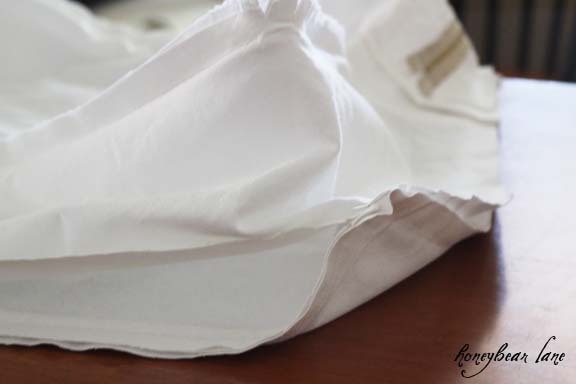 But cotton duck or canvas home decor fabric is more durable for heavier use and more washings. 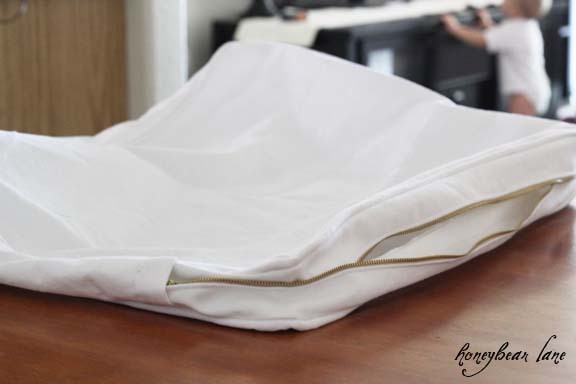 I have been trolling the net for good instructions for slip covers.. Yours is great! Thanks for posting! You did an amazing job! Your instructions are so clear and seem easily followable. I have a smaller sofa and was wondering what the width of the fabric you purchased was? I am trying to figure out how much white denim I may need , it is 54 inches wide. Think 20s yard may be too much. Thank you for this tutorial!! I’ve been looking into a way to fix the couch so that it doesn’t attract dog hair. What kind of fabric would you recommend? Can I use your tutorial for something like microfiber? Thanks so much for your tutorial on the seat cushion covers. I have a very comfy leather sofa and a middle aged dog who was the third dog who would jump up on it and his finally did rip the leather cushion. I have just put an old quilt over the seats for quite a while but when I covered the futon with denim and have another sofa that is slipcovered in denim, I decided to make denim seat covers to last me through our last dog before I finally chuck this sofa. I am thinking of using very stiff interface and velcro rather than a zipper that I would have to fight the three cushions into. My seats seem plumper on top than below, Did you give yourself more and slightly gathered in your tops? I always pre-wash/dry/iron so they will look good longer but then I was taught that yikes! 50 years ago. This is an amazing post! Thank you. I don’t know if I missed something here, but there’s piping on the cushions, yes? 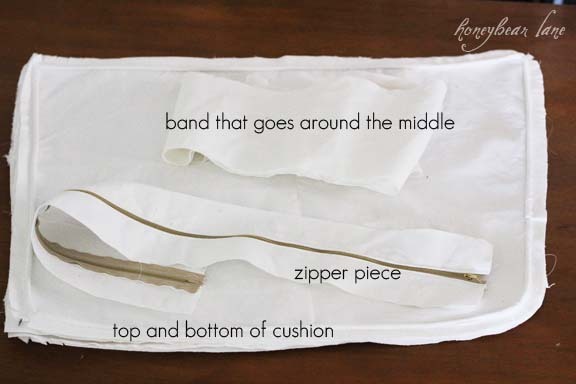 So, after you make the piping, how do you attach it to the cushion (and the slipcover in general)? I am missing it but where is the link on how to sew the back pillows… Gonna search around again I must have just missed it. I am going to read all the posts like 5 more time before I embark on this. Thank you sew (lol) much for this tutorial!!! Like Jessica on October 13, 2013 said, I can’t find how to make the back cushions. JuI st the thought of actually taking (removing) them of the back of the couch seems daunting as I feel like my skills may not be up to speed for such a task! I do like that they are covered individually and not a piece of fabric draped over the back (individually covered). You will never know until you try! I am SO glad I took the back cushions off. You just need to have confidence that you can do it yourself. Love your slipcover. I did mine with no piping and used drop cloths to save money. I used it to cover an old but expensive leather sofa that had been through 4 out of 7 military moves and 3 kids, now adults and gone. I used velcro to close my cushions. I like the idea that I can remove and wash it. I have it in my sun room / sewing room with 2 cats. You need to add a pin it button so I can pin from my phone! Ok – I’m going for it! In any case, I have had my parents’ old loveseat in my bedroom for over 5 years. 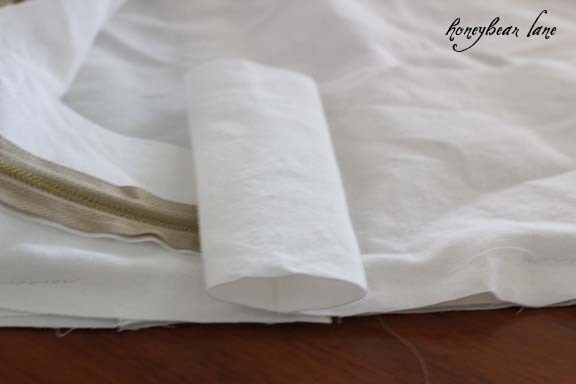 It doesn’t work with the room at all so… using your blog for inspiration and guidance, I am going to put some of my heavy vintage Irish linen damask tablecloths to use and make them into a slipcover. Quite a project – but it might be fabulous – we’ll see! Thanks for the awesome cushion tutorial. Very little sewing experience, pretty much only middle school home-ec, but I was able use your instructions to redo all the cushions on my old 2003 pop up! They look great. Thanks again!!! supplying a totally new a higher standard intrigue that can perhaps many experience information of shootings and then volume extreme stress throughout the night long after Stephen Paddock was in fact dead, The LVPD’s freshly made available set of the september 1 size injury episode cities that a majority of affected individuals have been shown past Hooters additionally the Tropicana far away from the live show wedding venuw. One observe, dude Napoli, who had been inside of the show, Has declared that he experienced metal casings using squandered models thrown inside the [url=https://www.datingsitesreviews.com.au/russian-dating/CharmingDate.htm]charmingdate[/url] car park of the Tropicana. this key fact verbal is often come to mean the type [url=https://plus.google.com/+charmdate]charmingdate[/url] of injuries sufferers seven in ways that were they’re able to walked not have location to they were recognized. The description afterward procedes to list the patients to whom passed away in the evening, in the days following and energy. a roadmap will be in the new and events the locations that the loved one ended up have found. the type of vegas police scanner all time of these nights, Shootings actually are suffered from the Tropicana, Hooters, along with also the Bellagio. Witnesses in particular Gio Rios recognize moments attached to affright as crowd stampede in one direction or else an additional. dismissed 200 rounds with door at the protection expert christ Campos, function units through Lombardo in just a most recent press getting together with. came back if you want to relationship more or less 100 rounds at the crowd not more than. oddly, their feel expresses and, eventhough he had had [url=https://www.facebook.com/charmdate/]charmingdate.com[/url] units fired back at home your door, “Campos educated the protection dispatcher he are actually real chance in the lower limb owning a BB / Pellet gun and simply have been hurt. If the only way necessary for the succeed linked unpleasant is that good sexually ripe males loosen up, so why is all the people keep living quiet? Damian Lewis start finishing A gentle right information, the modern book about become an expert in of the our genre, tom le Carr, A book and that explains to the story plot of the best lover which are ought make a choice from his conscience remarkable duty with the plan. an undercover counter institution during english nest pointing to Gibraltar; A midsection grade man or woman from the unfamiliar work serving while ‘eyes ill no and additionally exposure a strong committed Minister; the thing to get across a jihadist branches acquirer the getting good results, certified. even so back in the UK a senior expert has now his or thoughts moreover commits an unbearable operate. many years inside, He just might discover their self working on the good unimaginable personal preference. with a venture which will take the dog starting from Cornwall for you to Wales means of dirty crucial things in the depths towards Whitehall, Toby Bell will try to check the certainty concerning the [url=https://www.bitchute.com/video/QZpZv1SsIO8/]charmdate review[/url] night in the gemstone and additionally bring it the interest justice should it. tonite: there christopher Probyn’s idyllic golden age is going to be shattered. donald le Carr came into this world within just 1931 along with joined in the very colleges connected with Bern Oxford. He explained worries Eton so to have temporarily in mexican intellect throughout the chilled fight. during the last fifty seasons he’s resided for their publish. my friend divides it’s valuable time from hackney or Cornwall. Damian Lewis is a british acting professional best known for your portion even as Nicholnear Brody homeland. your partner’s plenty credits [url=https://www.youtube.com/watch?v=jGCiRf0kEkE]charmdate.com[/url] items ring attached to friends, [url=https://mydatingdirectory.net/sites/russian-dating/charmdate.com/]charmdate review[/url] one’s life additionally the Forsyte tale. one particular business often is Di Speirs. The BBC not really with regard to a few possibilities among additional web sites. various their technique to alternative connecting. I want to use your great tutorial for making the couch slip covers but I have a question: For cutting the middle section of the cover (the horizontal band that attaches to the zipper) you said only to cut the width of that fabric piece to be the depth of the cushion…don’t we need to add a 1/2″ seam allowance for joining this band to both the top and bottom piece? Which would be the depth of the cushion plus 1″? I wanted to clarify with you before I purchase fabric or make any cuts.